Who said scooters are just for kids? You too can enjoy meandering the streets like a carefree tween on a scooter perfectly designed for you. Electric adult scooters are all the rage. With a range of speeds, styles and abilities there is a scooter out there just for you. Selecting one from the wide variety on the market can be a challenge. 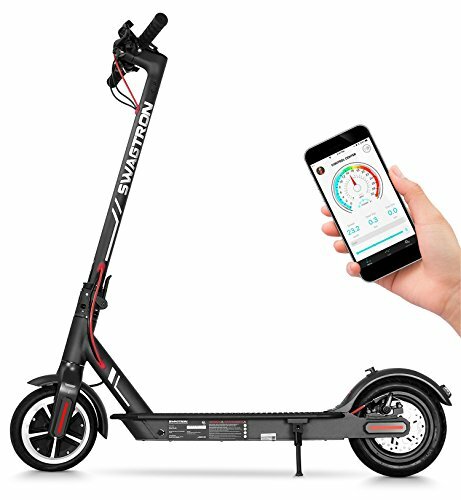 We’ve put together an information packed buyers guide to help you understand the variety of features that are available on these devices; and then determine which ones your scooter needs to have. Use our list of pros and cons to scan through our top five picks for the best electric scooter for adults. Each one is joined by a detailed product review so you know exactly what you’re in for when you place your order. A common misconception is that scooters are children’s toys. Historically speaking, yes. It was only in recent years that we saw the emergence of these devices as adult friendly alternatives to bikes or roller-blades. These days, however, electric scooters are far more popular among adults than they are children. Electric scooters are the latest in scooter technology. They are motorized devices that run off rechargeable battery power. The rider stands on board the unit and uses the handlebars in to steer the battery powered scooter. Due to their growing popularity, electric scooters have become fun for the whole family. If you’re between the ages of 6 and 60, you can be part of this scooting community. The first question on everyone’s minds is always: How fast and how far can they really go? As an industry standard, adult electric scooters can go up to 15 miles/hour at full speed. However some are even slightly faster. At full charge, most scooters will manage to cover between 12 and 18 miles before needing to be recharged again. This is dependent on external factors and climate. The terrain will also play a huge factor in how long your scooter will last per charge. If you spend a lot of time going uphill, your distance will be less than on flat or downhill terrain. Here are a few specifications to keep in mind when selecting the best electric scooter for yourself. It's imperative you pay attention to this factor as weight capacity affects scooter performance no matter the scenario. The weight capacity of each unit will vary from brand to brand. It’s also largely dependent on the materials used in the manufacturing of the unit. Buying a scooter that is not within your own weight bracket can be dangerous. If you’re too heavy for the scooter it may be damaged by continued use. It’s also not a bad idea to consider purchasing a scooter that can handle well above your own weight class. This makes sharing with others a safer and also has you covered should you gain any weight in the future. Handlebars should ideally be soft and padded so that use over long periods of time doesn’t bring discomfort. The floor panel of the scooter should be broad enough for all individuals to maintain a comfortable stance for the duration of the ride. Tires are another thing that play into the comfort of a scooting experience. The wider the tire, the smoother the ride. Durable, quality tires are worth the extra cost if it means your riding session is sturdy and balanced. This last tip has little to do with the ride and everything to do with the rider: Take regular breaks. Standing on a hard, moving surface for long periods of time can wreak havoc on your back and posture. Be sure to take regular breaks between rides to keep your spine comfortable in the interim. Electric scooters run on rechargeable battery packs. They are recharged using an everyday wall socket and regular AC electricity. Chargers should be included with the purchase of your scooter if you really want value for money - make sure one purchase covers all you need, because chargers are bound to be expensive at the hardware store. Depending on the brand, an electric scooter can take anywhere between four and 12 hours to fully charge. It’s usually recommended to leave your scooter charging for as long as possible in order to extend the battery life of the unit. Electric scooters are versatile to terrains. Naturally, it will be easier for a moving device to head downhill. It will use less energy and in turn less battery to do so. Electric scooters are, however, fully capable of going uphill. Going uphill requires a lot more power from the motor and will burn more battery life. This is why the distances per battery charge are only estimates. The terrain plays a big role in determining the total distance the scooter will cover before needing a recharge. It must be said that electric scooters rely on a mix of up and down hill rides in order to function properly. A constant journey of only uphill can cause the motor to overwork and eventually fail. Breaks are required between hill areas in order for the engine and battery to cool down. Adult scooters are obviously significantly bigger than children’s scooters and consequently harder to store. Electric scooters can be notoriously bulky and hard to transport as is. If you’re looking for an effortless option, it’s imperative that your scooter features some sort of folding ability in order to make storage possible. Generally, scooters fold where the handle bar meets the floor panel. They fold in half and can then be easily carried & stored either indoors or in a vehicle. Take note of the folded dimensions and total weight of your unit before making your purchase. You need to be sure you’ll be able to carry the scooter around when it’s not in use as you never know when you may have to carry it with you should the weather turn bad or the battery die. Though you might feel silly donning a full set of elbow and knee pads, these are sometimes absolutely necessary - especially when learning to ride. A helmet is always a valuable device to have laying around. Even though these scooters don’t go as fast as other outdoor transportation they can still cause injury should you find yourself on the pavement. Be particular conscious of the rules of the road when riding your scooter. The same laws apply as if you were on a bicycle, skateboard, or roller-blades. Keep in mind that motorists may not be accustomed to seeing individuals riding scooters on local roads. Their lack of awareness could put you in danger while sharing the streets with their own vehicles. That being said, electric scooters are safe for enjoyment. They pose little more threat to a human than a regular stroll down the road would. Now, which one will you be coasting down the street on soon? Here is a sleek and stylish little black number from well known brand Gotrax. This scooter is renowned as the device to have if street riding is your thing. We particularly love the inclusion of an informative screen. It will let you know your speed and also when it’s time for a recharge. 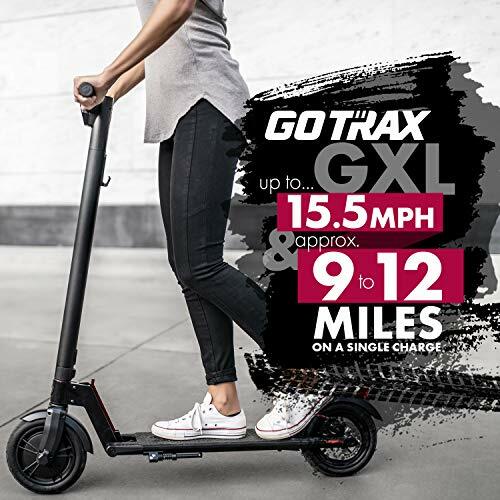 The Gotrax recharges in around four hours - this is impressive when compared to units with less distance capability but longer charging times. The scooter folds neatly in half and can be tucked away easily in a nook or cupboard. The neck of the scooter forms a carry handle when folded, making porting easy as well. It only weighs 31 lbs, which is a manageable weight for the average human being. A matte black electric scooter? We’re sold! This stylish little gadget is the brainchild of another well trusted brand called Xiaomi. Under specific conditions (not much uphill) this scooter will cover up to 18 miles in one charge. This is considerably more than a lot of its competitors. At full speed you’ll travel 15.5 miles per hour. 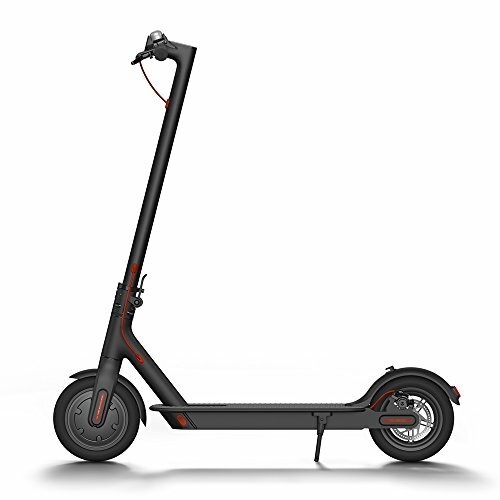 The Mi Electric scooter has two brakes instead of one. Most eclectic scooters only feature the hand brake behind the handlebars. This unit has this as well as a foot powered brake over the rear wheel. This is great for emergency situations. The frame is aluminum based and weighs a mere 26 lbs. When folded it’s a breeze to carry around and simple to store. The Mi Electric is the perfect travel scooter due to its lightweight nature. The minimalist design of the scooter body also makes it particularly aerodynamic for a smoother ride. There are built in head and tail lights making the scooter usable in low light or even full darkness although not recommended to be used in complete darkness. 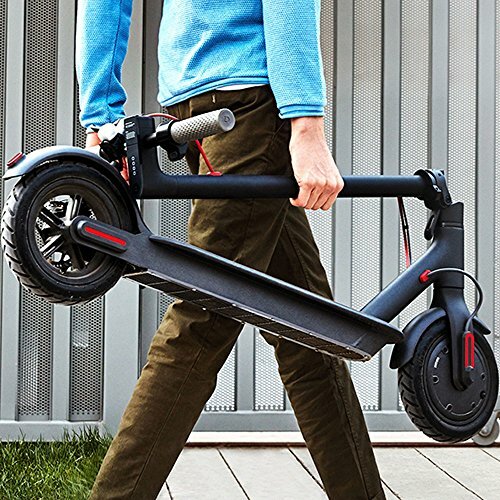 Another impressively lightweight scooter: The Swagtron comes in weighing just 27 lbs. What distinguishes this scooter from the rest is the built in phone mount. The scooter links to an iOS or Android app that needs to be installed on the rider’s phone. Through this the rider can track distances and even change gears if desired. The app will also control the sleep mode of your scooter which can be used to save energy when the unit is not in use. For those who prefer not to use a cellphone while on a ride, there is a built in display screen to give you all the information you need. The scooter can also support an impressive weight of up to 320 lbs. This is significantly more than the average adult scooter. 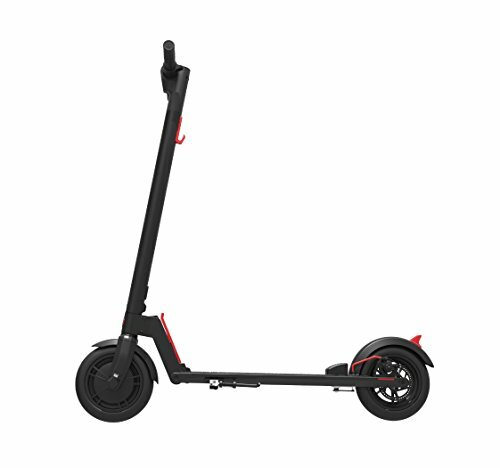 The distance ability of the scooter is largely uncertain: Anywhere between 6 or 12 miles on a single charge. This is all dependent on the terrain and the weight of the rider. Since the scooter can hold much heavier riders, the distance covered will be implicated. Lighter riders will reach closer to the 12 mile mark during a single charge. The Swagtron features the option of three different gears. You can shift through these as needed depending on the terrain you’re facing. 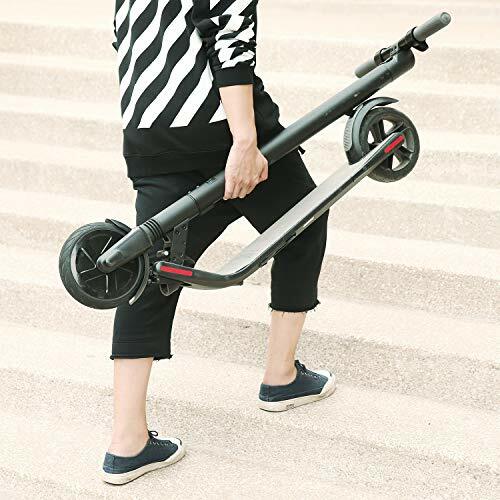 First and foremost we must mention the most impressive feature of this performance packed scooter by Glion: Not only does the scooter fold up into a compact version of itself, it also transforms into a self rolling unit in the process. 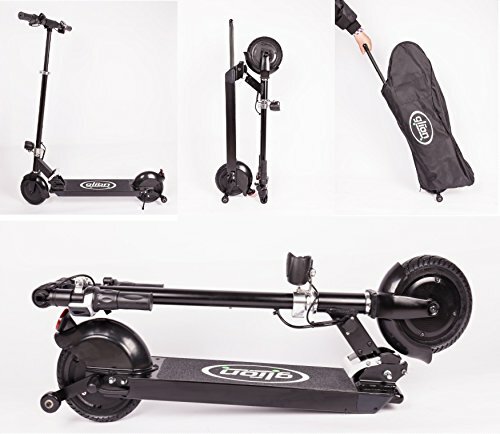 The wheels rotate and the scooter becomes a convenient unit to port around the same way you would a piece of luggage - Pulling the handle and allowing the wheels to do the rest. The carrier bag slots over the entire scooter for a luggage-like appearance. It weighs almost 28 lbs. It’s the most ideal electric scooter to take along on travels. Most impressively this scooter recharges itself fully in a little under 3.5 hours. In more rushed occasions, the soccer can reach 75% charge capacity in just 2 hours. It reaches a maximum speed of 15 miles/hour as well as covers 15 miles on a full charge. We love the inclusion of no-flat, zero maintenance tires. They’ll never need to be refilled with air. Your ride is guaranteed to be smooth and the body will stand the test of time no matter what the terrain. Glion has included head and rear warning lights for safety on the roads. The brand’s proudest selling point is that with its scooters you’re able to travel over 500 miles in distance for just $1 worth of electricity. Segway is the globally recognized name in electrical motion technology. You’re likely already familiar with the popular platform-style Segways that help people get around quickly in many of today’s public places. Similarly, these Segway scooters will transport you short distances with ease. The distance range on this sleek and stylish device is 15.5 miles, give or take. It features a front LED light and screen display to keep you informed about all the specifics concerning your ride. As an added safety feature, it includes both a hand and foot powered brake. This brings the scooter to a quick stop in the event of an emergency. The Segway electric scooter can reach speeds of up to 12.4 miles/hour. This is weight dependent and could be significantly less or more depending on the rider. This limited speed range allows the device to be used by teens and adults alike. 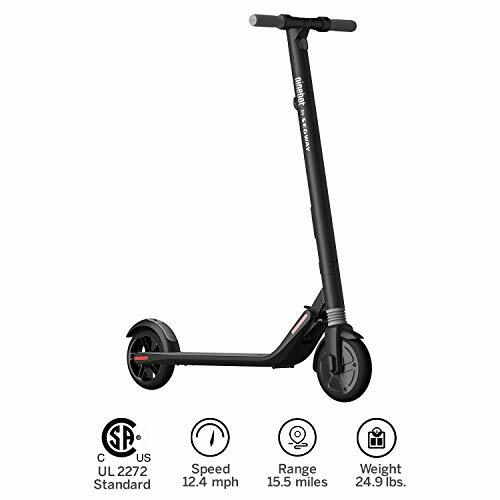 It’s safer than other scooters that reach much higher, less manageable speeds. You’ll be able to share the fun with your family. Weighing in at just 25 lbs total, this was the lightest electric scooter we could find. Carting it around is simple as is storing the scooter thanks to its compact design. Is it legal to ride on the pavement/sidewalk/road? For the most part, yes. As long as you’re not obstructing the flow of pedestrian traffic you’re good to go while riding on pavement. It’s your responsibility to ride safely and keep those you pass safe in the process. Quiet suburbs with little to no foot traffic would be the ideal place to take on the pavement. Make note of areas with significantly heavier pedestrian crossing traffic and avoid these where possible. Do not attempt to ride your scooter on pavement that border schools or public amenities such as libraries and pools. This is solely dependent on the area in which you live. Different states have different laws surrounding the use of electrical scooters. Most don’t require any form of licensing. Others may require special permits to buy or rent a device for recreational use. Be sure to look into the laws surrounding scooter usage in the town in which you live. You don’t want to be caught by law enforcement and for something you simply didn’t know. Indeed most electric scooters can shift between motorized and manual usage. This is often done by lifting a lever attached to the floor panel of the scooter. 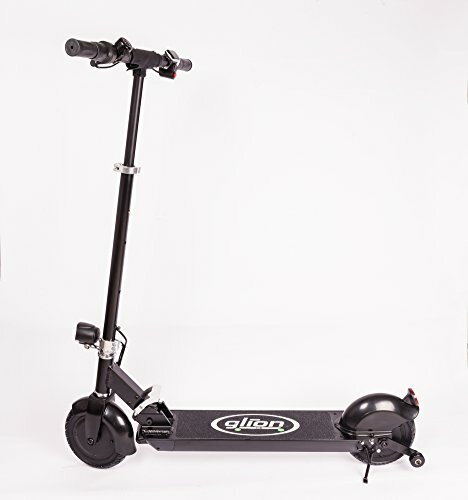 This lets the scooter know that the battery has died but the rider intends to continue use of the device through his or her own effort. Riding a scooter manually requires pushing with one leg and balancing on the board in between motions. While it’s a lot of fun it can also be extremely draining over longer periods of time or distance. But as a plus is a great form of exercise. It must be noted that not all scooters can make this shift between electric and manual. 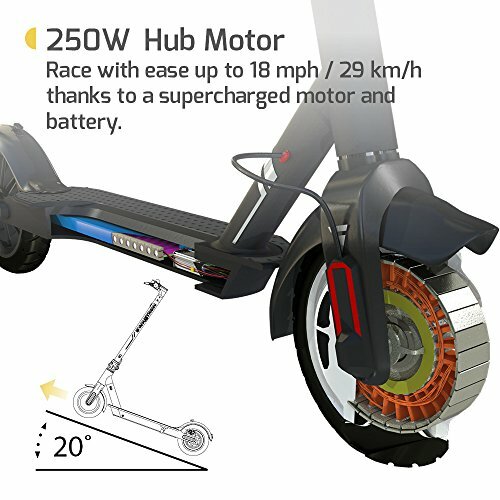 Research this aspect or ask the manufacturer before you buy as some scooters become completely immobile the minute the battery dies. Not very practical! Do you need to register them? This is again dependent on the area in which you reside. Most places may require an electrical scooter to be legally registered should the motor be above 50cc. Scooters rated below this can be used without without registration in most places, but again check to make sure of the laws where you live. Most readily available scooters don’t exceed this motor size and you won’t have to worry about registration at all. However it doesn’t hurt to confirm your scooter is on the road legally. This will pay off should you find yourself in any compromising situations or accidents in future. This is not a standard feature in all electric scooters, but it’s possible. Depending on the model, your scooter may have the ability to regenerate battery life every time the brake is pressed. This technology is something that is often found in electric cars. Similarly, your scooter will build up excess battery life for reserve use over long riding periods. Riding time can be limited in electric scooters, so any means of extending this is a welcome addition. Therefore, it’s worthwhile to buy a scooter with this ability, especially if you will often ride long distances. It’s nice to know that as an adult you no longer have to give up the simple pleasures experienced by children. The art of scooting is now readily available to anyone willing to invest the time and money. It’s also an activity that can be enjoyed by the whole family. But electric scooters provide more than just fun times. They are economically friendly and cost effective solutions to short distance transportation & can become a great addition to your daily life. Keep this buyers guide in mind when selecting the best electric scooter for you. Make sure you align features with your preferences so you get the most out of this investment. Which one did you order and why? Share your thoughts below.